I know I posted yesterday but posts have been few and far between this year. Why? Just busy and being in front of a computer all day at work means I have little desire to switch it on at home. But time for an update. We have bought a block of land and will be building a house at some stage in the next year. The uncertainty is related to the time scale on the property settlement which whilst we were told it would be August now looks like being closer to the end of the year. You can follow that journey of you wish at Destination 3977. If you drop by there please leave a comment :). At work the year started with me being given more responsibilities until Friday when they were all taken away from me. Nothing to do with work performance – more to do with a person not actually taking the time to understand what was actually being done. On an entirely different note (if you care to read it that way) I have never been one for empire building and nor have I been one to run to a boss and whinge, so I don’t have a lot of respect for people who do. In fact, rather than not a lot of respect, I have none at all. I also have no respect for people who point the blame elsewhere rather than take responsibilities for their own shortcomings. Son number one will find out in the next few weeks where his next posting will be. Of course, as most soldiers do, he is hoping it will be overseas. I’m happy if it’s not but recognise that he wants to do the job he was trained for. Son number two has his bed at my place now, but only sleeps in it a couple of nights a week. Daughter number one is in Europe and in fact by the time this post appears on the blog will be in Paris. She’s on a 10 week grand tour with a girlfriend and has so far visited England, Ireland and Scotland. Daughter number two had her fifth diaphragmatic hernia operation a couple of months ago and is recovering very well. Mum has had a polyp removed from her bowel and will get the results in the next week or so. She will be 80 next month. I know that I am probably both a dinosaur and a philistine and politically incorrect at times. But what he hell are we doing giving a bloke a $10,000 grant to fly paper planes inside the State Library. 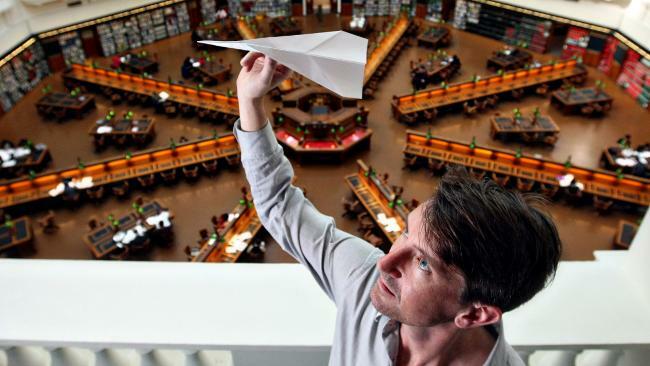 “AN artist has been paid $10,000 to float 10,000 paper planes in Victoria’s State Library. This is art? You have to be joking.